Chinese millennials, born in the 80s and 90s, are now hitting prime consumption age. Described as educated, open-minded and tech-savvy, millennials make up 31% of China’s total population, representing 415 million consumers. According to a report about Chinese millennials from Goldman Sachs, their aggregate income will grow by US$ 3 trillion during the next decade with their average annual incomes rising steeply over the same period. They will experience increasing purchasing power and will gradually become the main consumers of products and services. So who are they and what do they want? Read on to find out. In order to understand the consumption behavior of Chinese millennials, we have to start with the way they grew up. Due to implementation of the one-child policy in 1979, most are the only child in their family and had parents and grandparents eager to give them the best of everything. They were the center of the universe. The ‘little prince/princess/emperor’ factor is strong in this generation. They also prioritize their desires instead of their needs. As a result, when it comes to consumption, they are more demanding and more willing to spend. According to the same report from Goldman Sachs, among Chinese millennials, there has been outsized spending on smartphones, key fashion accessories, travel, fun experiences and small splurges where brand and quality matter. They want good products and services and they want them fast. Daxue Consulting, a market research and management consulting firm focusing on the Chinese market, indicate that young Chinese consumers have shown themselves to be confident, discerning spenders; frugal and yet less price sensitive with luxury and high-quality goods. They’re happy to spend top dollar for entertaining, personalized retail experiences both online and at brick-and-mortar venues. In response to such demand, Adidas, for example, has recently introduced the Z.N.E. PULSE Hoodie series. Customers can either choose from one of the six patterns proposed by Adidas or create their own pattern. It has soon become popular in China, especially among young people and adolescents who like unique items. If brands would like to win the hearts of Chinese millennials, personalized and tailor-made products would be a wise choice. 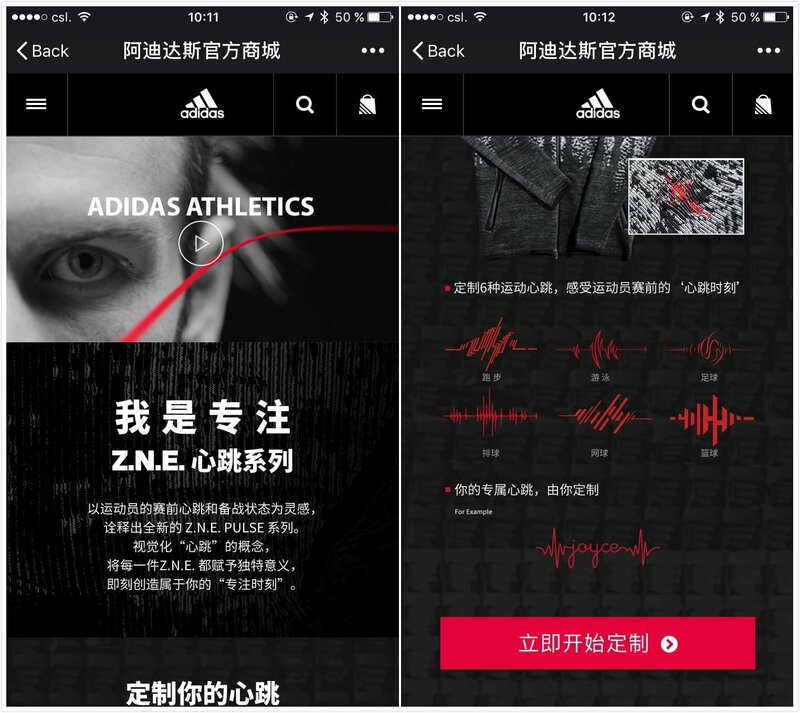 ↑ Customers are able to choose a special pattern or create their own ones on the official e-commerce platform of Adidas. Moreover, Chinese millennials grew up during China’s economic reforms that brought increasing global connectivity. They are eager to portrait themselves as a global citizen as they have witnessed the transformation of the country from a closed and backward nation to now the world’s second largest economy. They love to show friends and families their close connection to the rest of the world by buying standout and niche foreign brands that can demonstrate their one-of-a-kind tastes, which also distinguish them from others. They are far more educated and globally aware than their parents. They’re active on the Internet and social media, mainly because most of them do not have siblings to play with and hence turn to the virtual world as a means of socializing and entertainment. Therefore, it’s no surprise that they’re savvy online and mobile shoppers. Currently many brands have already merged their e-commerce with social media so as to increase brand exposure and facilitate the mobile shopping experience. Early in April, Longchamp launched a WeChat mini program dedicated to bag customization and purchase. Recently, since the end of August, the luxury brand has been promoting the Le Pliage Cuir Backpack on their mini program. Customers were able to choose the colour of the bag and print alphabets on them. After personalizing the product, customers can make the order and pay right away via WeChat Pay, which is already really popular among Chinese youngsters. This integration of socializing and mobile shopping perfectly caters to the preference of Chinese millennials. 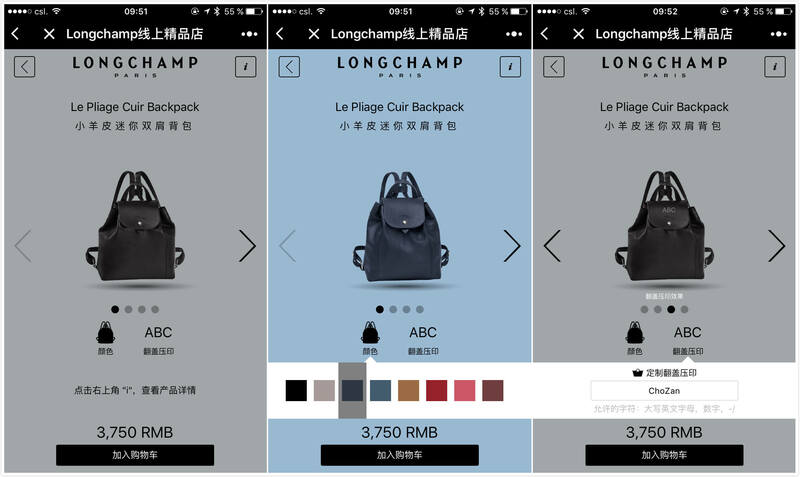 ↑ Longchamp’s WeChat mini program for bag customization and purchase. Social recommendations and word of mouth play an increasingly important role in the consumption process of Millennials. Since they spend plenty of time on social media, they are highly influenced by their peers, as well as the Key Opinion Leaders (KOLs). Therefore, brands have been increasingly adopting the KOL approach to promote their products and drive sales. Such a larger-scale KOL campaign may not usually be considered due to its huge budget, yet a small-scale one is also effective as long as the right KOLs are picked. 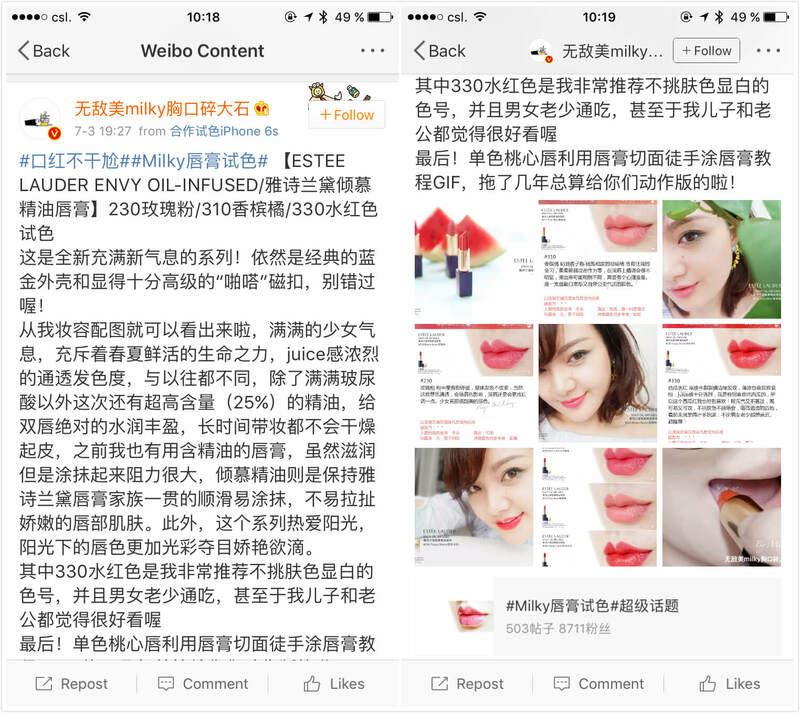 Recently, Estée Lauder worked with several beauty bloggers on Weibo, including @无敌美milky胸口碎大石, @小辣椒Irene and @啊曼大, to promote the new Envy Oil-infused Lipsticks. They tried the sample and wrote product reviews, resulting in over 3,100 interactions among young beauty enthusiasts who were very likely to purchase the products. Therefore, figuring out whether the followers of KOLs are exactly your target audience and keeping an eye on the fast-changing trends on social media are very helpful in marketing to Chinese millennials. ↑ A promotional Weibo post produced by the fashion KOL Milky. According to BrandZTM’s report, Top 100 Most Valuable Chinese Brands 2017, even though every consumer wants products or services that offer quality, are trustworthy, and help make their lives better, Chinese millennials in particular are more likely to favor brands that are famous or trendy. They like brands with positive and sincere persona, as they are able to distinguish whether the brand truly understands their needs, concerns and favorites, or if it is simply pretending. They will only be loyal to brands with attributes they affiliate to, and they like to see their lives being portrayed in media. For instance, post-90s are in their early adulthood and have just started exploring and achieving goals. If a brand can address on some of the obstacles they may face and recognize their effort, they will easily resonate with it and feel more connected. Hence, inspiring and empathetic brands are highly appreciated, especially when they communicate on the right medium. 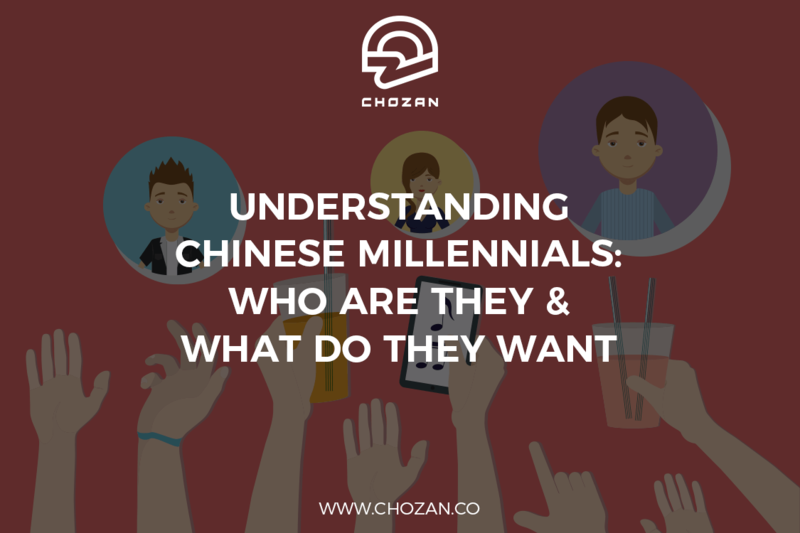 Chinese millennials are the main target audience whom marketers should not miss out. They highly cherish individuality and uniqueness, and never hesitate to spend more money in exchange for products and services they want. As they grew up with the Internet, they have already adapted to “living” in a virtual world. Exploring, purchasing and interacting online are their daily routines, which meanwhile enable marketers to approach them via different online channels, including the most popular social media platforms in China. To gain a better understanding of Chinese millennials, Chinese social media may be a good entry point.